As a value-added service for clients, Devlin’s Painting has extensive experience maintaining and managing residential and commercial properties for individual owners, realtors and community management companies. Property owners have trusted us for years to improve their buildings and and keep them updated and looking their best for customers, visitors and tenants. We are able to work outside of a commercial building during business hours and keep a crew on site after hours to move the work inside and get the job done. 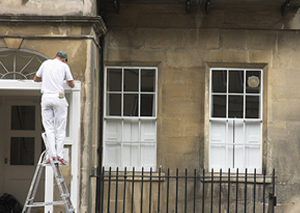 You don’t have to call multiple crews in to handle both minor repairs and painting. We offer the advantage of skilled, professional employees who can repair water-damaged drywall, install carpentry, and finish up a project with a new paint job in a timely manner. Our work crews are reliable and have all obtained background checks and clearances. Our goal is your complete satisfaction with our performance and your results.